This might seem a little severe but ask yourself, before you post Does my article need comments? More often than not criticism of your work is welcome, be it positive or negative. However if the page in question is a contact form, having comments at the bottom does seem a little pointless! Or you can disable all comments for your entire website from your dashboard in Settings > Discussion and untick Allow people to post comments on new articles. 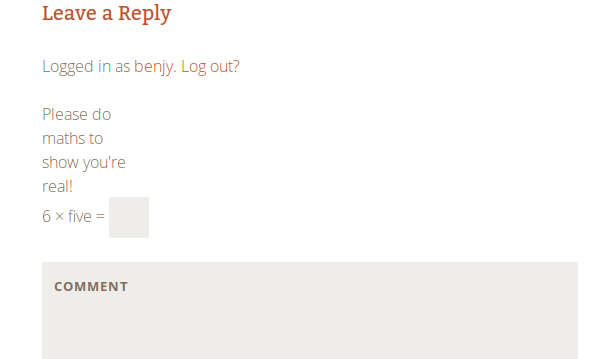 Changing your comments settings site wide will not change the settings on any posts already posted. Just those that you write afterwards. Captcha stands for “Completely Automated Public Turing test to tell Computers and Humans Apart” – you can see why they shortened it. However that does explain the point of them quite well. Captchas come in many and varied guises, some are just questions – literal or mathematical. Something like “What is two plus three” or “What is the first word in this sentence“. A quick search of WordPress’ plugins database turned up the helpful and succinctly named Captcha. This can be implemented in many places on your site. Not just in comment forms but also registration, lost password and login pages. The captcha itself is mathematical in nature (a good start in my book!) so no ridiculous words to try and read/type. The settings page for this plugin is neatly set out, offering the options I mentioned above plus the ability to not show these forms to logged in users. Obviously I had this option turned off to take this screenshot. Other minor settings to tweak are the mathematical functions to randomize between (addition, subtraction and multiplication) and whether to show the question with numbers or words (2 or two). I like the simplicity of this plugin as it means no visitor is likely to get annoyed at it. It’s easy to implement and once it’s installed you can forget about it and leave it to do its thing.This plugin seems to ticks all boxes for me, its clean, simple, does everything I expect of it and should be all most website owners really need to combat a lot spam comments. This method blocks spam without putting any demands on you the site owner, or any real visitor wishing to comment. Instead the comment is reviewed by an external process to assess whether it is real or not. Most wordpress users are familiar with Akismet; an anti-spam service often used by wordpress to filter out spam externally. However there are alternatives. One such alternative is the (again) imaginatively title Anti-Spam by Webvitaly. According tot he comments this plugin is very good at ensuring spam gets no where near your website, claiming too that it is even better than Akismet. This plugin is more difficult to trial as I won’t be able to see how successful it is for a few weeks but I will give it a go and see. The plugin itself seems very simple to set up just install, activate and leave. Not even an api key to register for like there is for Akismet. So there we have it. Three very different ways in which to cut down on your spam comments, quickly, easily and with the minimum of fuss. I think personally I will stick with the simple captcha. I don’t like the thought that any of my sites comments could be lost into some filter never to be seen again. If a visitor to my site wishes to share something, hopefully doing a little light arithmetic won’t be too much of a problem! ← Previous Post Surely a Google April Fools!